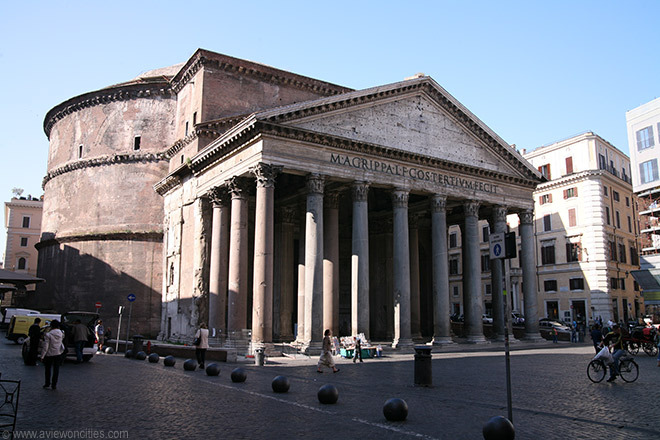 The Pantheon was built by the Romans as a temple to all gods, the building is over 2000 years old. Today it is a Catholic Church. 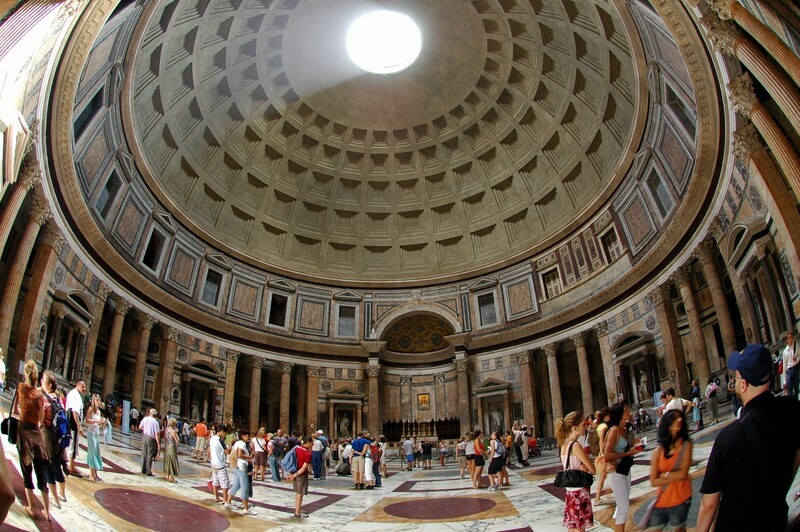 The structure features the largest dome in the ancient world, made of concrete and masonry. It was built on the orders of the Roman dictator Agrippa circa 30 B.C. What remains of the original structure is the front porch with its sixteen marble columns. Emperor Hadrian renovated the temple circa 117-125 AD, adding the domed structure. 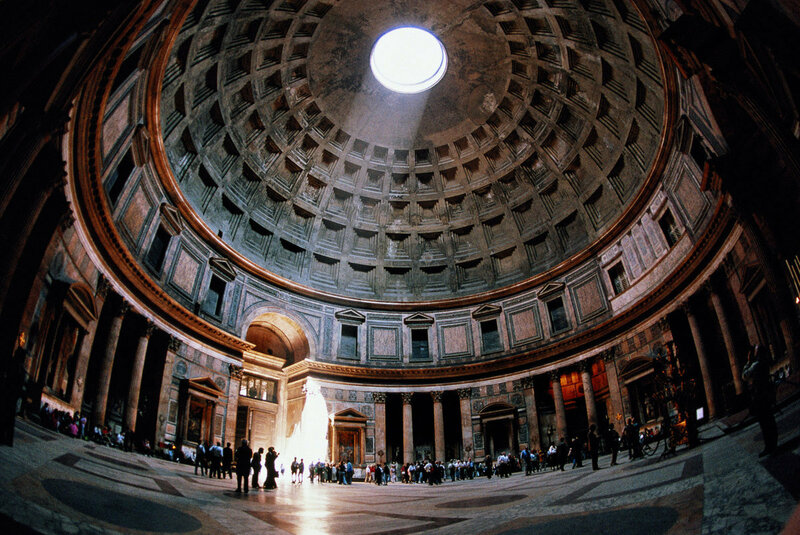 The dome of the Pantheon was not surpassed until the 20th century when domed structures were created using steel reinforcements. The dome features a hole on top called the "oculus." It funnels sunlight into the buildings atrium, and at various times of the day and year, a beam of light illuminates a portico along the wall containing a statue. The oculus also allows rain into the building. A floor curved toward the center of the atrium allows water to drain at the center into the sewer system. The structure was almost destroyed in the Dark Ages, had it not been turned into a church. This, however, did not prevent people from destroying surrounding structures and removing most of the metal from the building, including the metallic covering of the dome. Rope marks are evident on some columns, due to attempts to pull down the columns using horses. During the Renaissance, the exterior was modified with wing like structures, which people refereed to as donkeys ears. These were eventually removed. The floor of the interior of the structure is scared with divots and grooves, made from the spurs and spiked boots of men over the past 800 years. The original statuary is gone. It has been replaced with Christian statues and icons. Additionally, the Pantheon was used as a tomb for Italian nobility. The interior is completely round. Opposite the main door an alter is installed for use in Catholic Mass. Outside the structure in its surrounding Piazza della Rotunda, is an obelisk and water fountain. Opposite the Pantheon there is a McDonalds restaurant. In the Piazza there are dozens of local restaurants and pubs. Near the Pantheon is the church of Sta. Maria Sopra Minerva. The quarter is densely packed with tourists most of the year. © Hotel Stendhal Roma 2019 · Powered by: Fisheyes Ltd.